For fish oil users who also want to SLOW skin aging and receive maximum antioxidant support. New Zealand’s exclusive Omega 3/DHA Fish Oil Premium Is for you! Slow skin aging! You get additional antioxidant support in every serving of Omega 3/DHA Fish Oil Premium to enhance skin appearance – so you can experience a more youthful glow. Visibly reduced effects of photo-aging caused by excessive sun exposure and UV radiation! Omega 3/DHA Fish Oil Premium contains Lyc-O-Mato® – a complex lycopene extract from tomato oil that’s been scientifically shown to increase skin density... increase skin thickness... decrease scaling of the skin... and decrease skin roughness! That’s means YES – you can have great looking skin again. Create an army of free radical fighters! The potent antioxidant AstaPure® astaxanthin in our formula is derived from natural algae. This gives your skin a rich source of free radical support to help reduce the appearance of fine lines and wrinkles... and support the healthy function of skin cells! With regular use of Omega 3/DHA Fish Oil Premium – you may notice that your skin is noticeably more radiant and refreshed. If you are interested to know more about astaxanthin and human health you can download the complete study here. Increase skin density! Helps skin look firm and healthy! Increase skin thickness! That’s more elasticity – so skin can stay smooth and reduce the appearance of fine lines and wrinkles! Decrease scaling of the skin! That means real protection for the outer layer of skin cells! Decrease skin roughness! Gets rid of rough patches and keeps skin feeling smooth and soft! Here’s why Omega 3/DHA Fish Oil Premium is New Zealand’s finest fish oil formula for age-defying skin support! The pristine and uncontaminated waters off the coast of New Zealand hold part of the key to the potency... purity...and perfection you get in our exclusive Xtend-Life Omega 3/DHA Fish Oil Premium! Great looking skin: Combining Lyc-O-Mato® lycopene with AstaPure® astaxanthin delivers remarkable skin health benefits in every serving! Clinical studies on these powerful antioxidants show benefits in regard to skin redness... scaling... and density. Additional prostate support: Lyc-O-Mato® extract belongs to a class of carotenoids that have been shown to be effective antioxidants which may help support and maintain prostate health and function. Watchdog on alert for abnormal cells: A recent study showed astaxanthin caused inhibition of 5alpha-reductase – an enzyme associated with abnormal cell growth in prostate and breasts. Contains New Zealand hoki fish: Harvested from the pristine waters of the Southern Ocean off the coast of New Zealand. Thanks to the equatorial currents which prevent many of the contaminants in the Northern hemisphere waters from crossing the equator – these are some of the purest waters found in the world. High DHA content: DHA is known as the most valuable component of fish oil. Xtend-Life’s Omega 3/DHA Fish Oil Premium contains high levels of DHA (30%). Bio-availability! We use hoki fish oil in the form of natural triglycerides and tuna oil in the form of concentrated esters! This makes Omega 3/DHA Fish Oil Premium highly bio-available – so your body can properly utilize our formula for maximum benefits. Freshness! We never use additives or flavoring to mask rancidity. What’s more – you won’t experience embarrassing “fish burps” or smells with our fish oil. Our Omega 3/DHA Fish Oil Premium blend is ideal if you want enhanced antioxidant support to improve skin appearance and overall wellness along with the powerful benefits found in our standard fish oil formula! Other Ingredients: Soft Gel (Gelatin, Glycerol, Water, Annatto), Beeswax, Antioxidant Blend to preserve freshness (Vitamin E Oil, Rosemary Extract, Ascorbyl Palmitate). If you are pregnant or lactating, see our standard Omega 3/DHA Fish Oil. 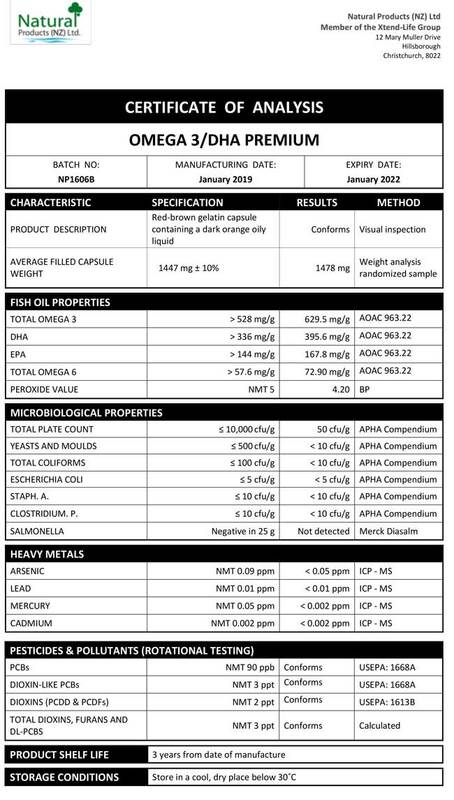 We have included below a copy of a typical Certificate of Analysis (CoA) for our Omega 3 Premium Fish Oil. You will note that there are two columns which are headed 'Specification' and 'Results' respectively. The specifications are simply our minimum standard to which each batch of Xtend-Life Omega 3 Premium Fish Oil has to conform, otherwise we would not release it. The results are the actual results from the independent laboratory that did the testing. Why is this product more expensive than Omega 3 DHA/Fish Oil? The Premium version has two natural carotenoids added to our base Omega 3 DHA/Fish oil in the form of Astaxanthin from algae and Lycopene from tomatoes both of which increase the cost of manufacture. If you are a woman (or a man for that matter) and you wish to slow down the aging of your skin (by promoting beauty from within) then it is certainly worth the extra. Apart from these benefits, if you are a man it is worth it just for the Lycopene which is well established as a crucial nutrient to help in supporting a healthy prostate. Will Omega 3/DHA Premium help my skin? It is becoming rough and leathery with aging. There is good clinical proof that both Lyc-O-Mato® (the form of Lycopene we use) and Astaxanthin may help reduce the roughness and scaling of your skin. In fact, it may even increase the thickness, density and natural moisture levels of your skin. Hoki (Whiting) is sourced from the pristine waters of the Southern Ocean off the coast of New Zealand. The Tuna is also sourced in the oceans of the Southern Hemisphere.